The newly elected Member of Parliament (MP) for Ayawaso West Wuogon, Lydia Seyram Alhassan, says she bears no grudge against the opposition National Democratic Congress (NDC) MPs who made disparaging remarks about her when she was being sworn into office in Parliament on Tuesday. 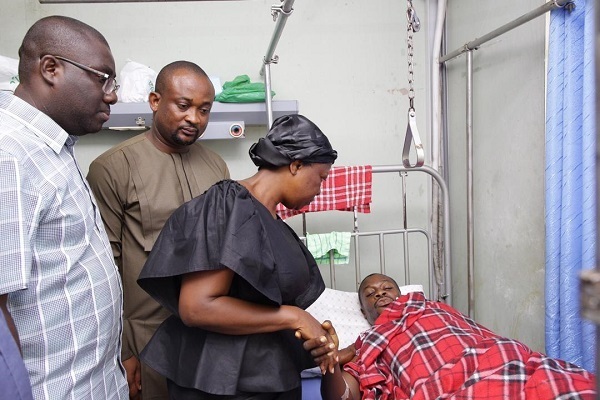 “I am surprised the ladies in Parliament, who want more ladies to join leadership, will do this,” she said yesterday when she visited some of the victims of the Ayawaso West Wuogon by-election violence at the hospital. In what could be described as defying rules of indecency, the Minority members, clad in black, displayed placards with the inscription “Bloody Widow” before walking out of the House. “It is sad that this shameful display was carried out in no other place than the Parliament of Ghana – 26 years after Ghana made global commitments towards respecting women and promoting the involvement of women in politics,” she added. “The Minority was out of line. If the Minority will take time to reflect and want women to be part of politics, they will apologise. It is important that members of society teach people how to disagree in a civilised manner,” she told Accra-based Joy FM.